This badge recognises adult years of membership to Girl Guiding for those aged 18 or over in Australia, or as per definition of adult in the applicable WAGGGS Member Organisation. The years will be counted from the date the individual becomes an Adult Member of GGA/SGGO and/or other WAGGGS Member Organisation. Time is counted cumulatively to receive the award and the onus is on the applicant to provide evidence. Years of membership do not have to be consecutive. A “Years of Membership” badge is presented after one year of membership. At three years of membership, a number chain is presented with a ‘3’ numeral, then at five years, a number chain is presented with a ‘5’ numeral. At five year increments thereafter the chain with the appropriate numeral is presented (e.g. ‘10’, ‘15’, ‘20’ etc). This badge is applicable for all Adult Members regardless of their role ie Leader, Manager, Olave, Unit Helpers, Trefoil Guild, Life Members or Adult Member with no current role. An adult member of a State Girl Guide Organisation is a female aged eighteen years or over who satisfies the requirement of membership. A Unit Helper or Support Group Member who becomes an Adult Member may include their time as a Unit Helper or Support Group Member when applying for Years of Membership Badge. Non-Member Volunteers may be presented with the Volunteer Badge any time after one year of contribution. Numerals on a chain may be added as appropriate, if desired. Time is counted cumulatively to receive this badge and the onus is on the District/Region Manager to keep records. Non-Member Volunteers include Girl Guide Support Group members, District Support or Management Team members or any other volunteer who actively supports Guiding. Dar k blue bar with guilt knot. May be worn in or out of uniform. Numbered chain to denote years. Scope of Recognition Non-Member Volunteers include Girl Guide Support Group members, District Support and Management Team members or any other volunteer who actively supports Guiding. 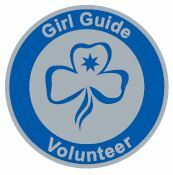 Descriptor: Recognising support of Girl Guiding by Non-Member Volunteer. Who can make the application for an Adult Member to receive this badge? Any Adult Member or Non-Member of a State Girl Guide Organisation or an individual member of Girl Guides Australia. Dark blue circle with silver Trefoil in the centre. May be worn in or out of uniform. Membership Organisations have their own process in place in regards to Years of Membership Badges. For details please contact your State Office.